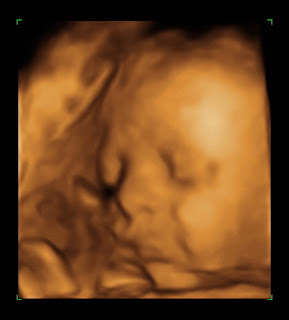 Abby & Milo: 30 weeks! 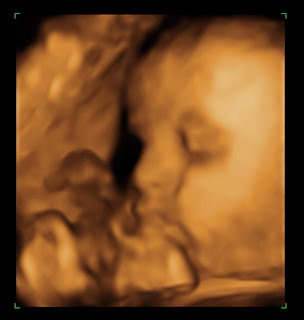 We had our 30 week 3-D sonogram today and our baby boy was very cute and cooperative, he kept his hands away from his face the whole time! His little foot was blocking his boy parts though so we only got to see that he definitely has a scrotum. 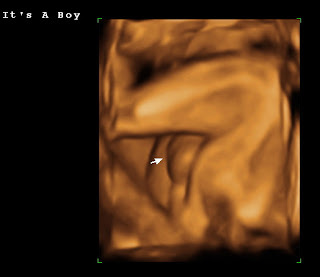 He measured at 4lbs and 3oz, the norm for this age is not quite 3 lbs, and the doctor said that this means if he continues to grow at this rate, by my due date, I will have a 9 lbs baby! Because he’s so large and I’m so small I will be having another sonogram at 36 weeks to better judge how big he is. 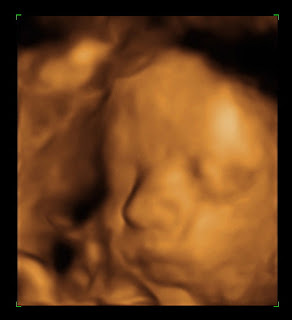 We still don’t have an answer to whether or not I will have to have a c-section, and we probably won’t know until it gets very close to my delivery, which is fine with me even though it is a little frustrating. I get different opinions from all the doctors involved in our care. So we’ll see. Hope you enjoy the pics of our precious son! Wow... still definitely a boy!!! And a BIG boy!!! I was so thrilled to see your pics. Thanks for posting them! This is Pam C, from Hobbs, and now Houston area... your mom encouraged ALL of her friends to come look... to see your baby's beautiful pictures!!! Wow Abby! These pictures are amazing!! I hope our boys get to meet someday!